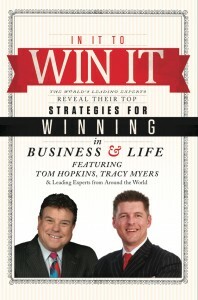 Tracy Myers has joined with a select group of the world’s leading business experts and best-selling author and speaker, Tom Hopkins, to publish the forthcoming book titled In It To Win It: The World’s Leading Experts Reveal Their Top Strategies for Winning in Business and in Life! Nick Nanton along with business partner, JW Dicks, recently signed a publishing deal with each of these authors to contribute their expertise to the book, which will be released under their CelebrityPress® imprint. Tracy Myers is a Certified Master Dealer and was the youngest ever recipient of the National Quality Dealer of the Year award by the NIADA, which is the highest obtainable honor in the used car industry. His car dealership, Frank Myers Auto Maxx, was recently recognized as the number one Small Businesses in NC by Business Leader Magazine, one of the Top 3 dealerships to work for in the country by The Dealer Business Journal and one of the Top 15 Independent Automotive Retailers in the United States by Auto Dealer Monthly Magazine. Myers has been a guest business correspondent on FOX News, appeared on NBC, ABC and CBS affiliates across the country, been featured in USA Today and written for Fast Company. His inspirational stories and strategies for success are in demand across the country which has given him the opportunity to share the stage with the likes of with Zig Ziglar, James Malinchak, Brian Tracy, Mike Koenig, Bob Burg and Tom Hopkins…just to name a few. His best-selling books help people become better consumers as well as inspire industry leaders to become “game changers.” He was also the star of the Telly Award winning film “Car Men”. In It To Win It: The World’s Leading Experts Reveal Their Top Strategies for Winning in Business and in Life! will feature entrepreneurs and professionals from around the world revealing their top secrets on an array of subjects ranging from health, wealth and marketing, to business success. Some of the topics covered in the book include meeting client expectations, luxury home marketing, growing your virtual business, keys to highly successful marketing leaders, thinking like an owner, re-engineering your sales force, the psychology of sales and creating loyalty, among others.